My first reaction was to simply respond by saying “Write. A lot.” But then I realized that whatever success I’ve had as a writer was not due to writing a lot. Sure, the more I write the better I get at it, but I don’t believe writing is what made me a good writer, if a good writer I be. I learned how to write not by writing, but by reading. A lot. I owe my love of reading primarily to my mother. I can’t remember when she started reading books to me, but I know that by age 3 it was a nightly ritual. I remember how on many nights she would make a plate of apple slices with peanut butter, and I would eat them in bed while she sat in a small chair next to me, reading books like One Morning in Maine, Harold and the Purple Crayon, and Make Way for Ducklings. My mother took me to the library at least once a week when I was young, as I recall. The librarians in Arcadia, California knew me by name. 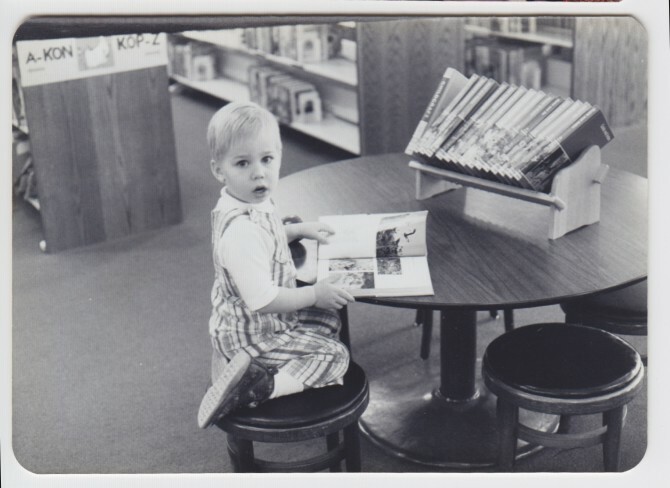 Me at the Arcadia, California library, circa 1978. Yeah, I used to be cute. What happened? I have many fond memories of reading books at the library. I remember a summer challenge to read 100 books or some large number like that, which my mother helped me meet. When I was a little older I remember coming home from the library with large stacks of books by Alfred Hitchcock. I loved Hitchcock’s ghost stories for children. I also read every book I could from the Three Investigators, Hardy Boys, and Nancy Drew series (I may or may not have had a crush on the 30s version of Nancy Drew). What I wouldn’t give to own the same hardback copies the library used to have. In 1st or 2nd grade I remember getting into a reading contest with my friend Ian Singer. He found a copy of a “long” book in the Camino Grove Elementary School library and read it. I’m not very competitive, but I broke character on this one, and found Rifles for Watie. It was 352 pages. I had never read anything so long. Nobody in my class had read anything over perhaps 150 pages. I read it. But by the time I finished it I didn’t care about having read a longer book than anyone else. I was just excited to know I could read a book that long. By 3rd grade I was reading The Hobbit and The Lord of the Rings trilogy, and I was hooked. My parents were frugal about most things while I was growing up, but not books. Our family only went out to eat once a year–at McDonalds, and we could only order two things off the menu (so frustrating, we could never have a hamburger, fries, and a shake, we had to choose two out of three). Despite my brothers being 11 and 12 years older than me I wore hand-me-down clothes including jeans with patches on the knees. We weren’t poor, my parents just didn’t put much stock in buying new stuff when something else would do, I suppose. Except for books. At some point the library couldn’t satisfy me, and we started going to Vroman’s Books at the Santa Anita mall. If I wanted a book, it was mine. My parents must have spent a fortune on my reading habit, because I read books like they were water and I was dying of thirst. A lot of books I read more than once. I lost track of how many times I read The Hitchhiker’s Guide to the Galaxy series, but it was something around 25. I had the books memorized. In high school I would have someone read any four words in the book, then close the book and hand it to me, and within a few seconds I could find the page they had read from. I didn’t realize how much I was reading until I went to college. After my first year I had filled up a bookshelf with books. If I stacked them one on top of another it formed a stack about four feet high. I had read all of them at least twice. If instead of books they had been empty booze bottles, you would have said I had a serious problem. At this point I still hadn’t written much of anything. Sure, I had some good times with creative writing in elementary school. There was the time my 4th grade teacher told me she took my stories about “The Little Rascals and the Toilet Bowl Man” home to her husband and they read them and laughed and laughed. That made me feel good. The next year I wrote an essay against the school’s policy of school uniforms and advocated a violent response, which resulted in my getting kicked out of that school. That was kind of fun as well. I won an award for a poem I wrote in 8th or 9th grade. But I really didn’t write much, or give it much thought. Not until I was about 26 or 27, around 2001. It was around 2001, maybe 2002, that I started this blog. I wrote nonsense stuff at first. Just whatever I felt like writing. There was no focus. Then I started focusing on entrepreneurship and digital marketing. I mostly wrote about my own experiences, because that’s what I knew, and I always remembered the advice from the movie I Remember Mama to “write about what you know.” I didn’t care if anyone else read what I was writing. If they read it and commented that was fun, but I mostly wrote just because I loved writing. I would have written even if I knew nobody was reading what I wrote, and it often felt that way. After I got married I stopped reading much for several years. It just didn’t fit into my schedule. Around 2007 I started reading again. Not just books, but articles as well. I read 2 to 5 books per week now, and somewhere between 10 to 50 articles, depending on the week. I don’t read in order to write, except for occasional research for a piece, I mostly read because I enjoy reading. As I wrote more and more on my blog, I would get a positive comment from someone every once in a while, but like with my childhood writing I didn’t think much of it. I didn’t know what to think of it. It wasn’t until I got the opportunity to write for Forbes and published a few articles that I felt like I had found my calling. 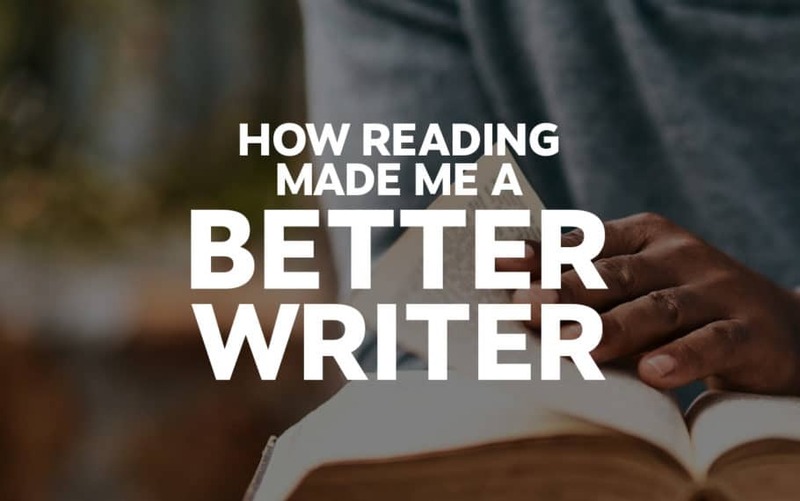 I think part of it was the validation of readers, but I was also putting more effort and thought into my writing, and the more I invested in it, the more I realized how much I enjoyed the craft. I have never experienced writer’s block since starting to write for Forbes–on the contrary I have way more ideas than I have time to write about. Reading boosts your vocabulary. I’m a fan of simple speech. I always try to opt for the shortest, simplest, most easily understandable way to say something. I don’t want flowery words to distract people from the ideas I’m trying to get across. But the more vocabulary one has, the less fear one has about putting words down, even if most of that vocabulary goes unused. Reading good writing makes good writing sound “normal.” I don’t think much while I’m writing. I just write. I don’t do much editing afterwards, either. Sometimes I don’t edit at all. It probably shows. The point is the words come out easily, and I believe that’s because as I’m putting a sentence together I can feel whether it’s right or wrong, awkward or comfortable. When I end up with a bad sentence, it’s usually because I went back to edit something but then failed to read the whole sentence or paragraph I just edited, so I end up with something disjointed that needs to be smoothed out (ironically this sentence had a typo in it that wasn’t caught until my wife read this). When I go to write something down, or smooth it out after writing it, I don’t think about grammar, punctuation, structure, etc. I’m terrible at explaining that stuff. The other day I was speaking with a professional writer and I asked “What do you call those words that modify other words?” She responded “Those are adverbs.” “Oh yeah?” I said. “How about that, I don’t even know what an adverb is.” When I’m writing or editing I just read the line and think “Hmm, that doesn’t sound right.” Then my mind examines the different possibilities until it finds a combination of words that does sound right. And that’s what ends up on the page. It sounds right or sounds wrong because I’ve read so much that it’s like muscle memory–if it doesn’t conform to what I’ve read 1,000 times, it will just seem wrong, even if I can’t pinpoint or explain why. You could say that my blogging prepared me to write for Forbes, which was my big break. It certainly did, but I think it only played a minor role. I wrote hundreds of posts on this blog, but I don’t think my writing improved all that much during that time. What I write today isn’t all that different from what I wrote 10 years ago, or so it seems to me. I might be slightly better at choosing topics people are interested in, that’s all. I still give credit for whatever success I’ve had writing to my love of reading. Thanks, Mom.